In Slovakia the tradition of theatre festivals is closely connected with a rich tradition of Slovak amateur theatre the rise of which is dated into 1830 (presentation of Ján Chalupka´s Kocurkovo piece of acting in Liptovský Svätý Mikuláš). The amateur theatre gave a basis of professional theatre rise, and the Slovak National Theatre in Bratislava was founded in 1920 which played an important task also in forming of patriotic feeling and in spreading of the Slovak language. Turčiansky Svätý Martin became a Centre where the ÚSOD (Centre of Slovak Amateur Theatres) was founded in 1922. The ÚSOD organized a theatre competition and competitive shows in order also in such way to motivate ensembles to an activity and it supported the rise and propagation of original drama creation. The occurrence of festival was a natural outcome of regional competition at which the best ensembles of entire Slovakia could confront. The Scénická žatva (Scenic harvest) festival (it arose in 1923) is the oldest festival for non-professional theatres in Europe which takes place in Martin yearly. A series of regional progression rounds precedes this competitive show. At the Scenic harvest the winners and advancing participants from regional competitions encounter, then it is a competition of the best from amateur theatre for past season. At the festival are dramaturgical, actor´s, motional or lighting workshops and regular valuations of competitive performances. The winner gains the prize for a Creative act of the year from a specialist jury. In Slovakia several thematically focused amateur festivals with long-time tradition, e. g. Gorazd´s Močenok (festival of amateur Christian theatre), festival Anička Jurkovičová (pieces of acting with women´s subject matter themes), the Palárik´s Raková (original creation) and the like. The amateur theatre is typical rather for regions therefore the Amateurs festival arose in Bratislava in 2015, the task of which is to present the best from amateur creation of the last period. The festival is organized by SkRAT and A4 theatre, a space of contemporaneous culture and it is carried-out in the beginning of theatrical season, in the first half of September. The DIV (Theatrical Inspirative Performances) festival takes place in Trnava in November. It is case of a festival of various forms of amateur also professional theatre. Also a programme for children or the L+S and Astorka theatres favourite with viewers are found among alternative projects. The festival is played in Ján Palárik´s theatre in Trnava. The International Theatrical Nitra festival belongs among the most important festivals in Slovakia. It takes place yearly in autumn already from 1992. It brings not only top theatrical names from the whole world but it draws attention also to new artists and it supports mutual international cooperation among creators. The programme focuses on drama with transfers into the dancing, alternatively motional, opera also puppet theatres. In addition to the main programme, which is made-up of stagings of foreign theatres and of several Slovak performances, the discussions, specialized workshops, street activities, exhibitions, lectures or film projections are part of the accompanying programme. 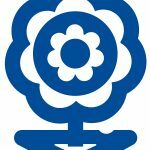 During the years of its existence this festival gained itself the viewers not only between Slovak specialists and lay public but it has a firm place also on the map of European festivals. The Eurokontext.sk is the second large international festival that is organized by Slovak National Theatre. It is a festival of the V4 theatres and selected partners from European Theatre Convention (ETC) which was carried-out for the first time in 2014. The drama and musical and dramatical genre alternate regularly in the festival orientation. The staging selection is connected by the theme, with which it reacts always to topical European problem. Thanks to this at the festival the general social and critical stagings not only appear but also the formally or thematically provocative ones appear. In the programme there are relevant theatres from the whole Europe regularly. The discussions and workshops are part of this. The Touches and connections festival came into being like the greatest and most representative show of the Slovak professional theatre in 2005. It takes place yearly in June in the town of Martin. Its aim is to present the best from the Slovak theatre in the last season. The performances for children, street theatre and the night open-air performances are part of the programme. The festival is a space for balance of season and of state of the Slovak theatre therefore a specialist teatrological discussion about performances seen is the regular part of the programme. After the performance the conversations with creators and actors are carried- out for spectators. The festival is organized by Slovak Chamber Theatre in Martin. The New Drama festival takes place in Bratislava in May. It arose in 2005 as a non competitive show of stagings of new drama, the goal of which was to support the contemporaneous creation and its presentation in Slovakia. Gradually it transformed into a competitive show of the best stagings of the Slovak and foreign contemporary drama that was presented in Slovakia in the past season. An international jury composed of Slovak and foreign specialists decides who is the winner which will obtain the New drama Grand Prix. The FOCUS section is part of the festival that every year will present a theatre of other country by a form of performances, lectures and staged readings. In the accompanying programme there are lectures, discussions, conferences and evaluation of the Drama competition for the best contemporary text in the Slovak and Czech language. The next thematic festival is On the stage alone that takes place always in the town of Trenčín in September. It is a case of an international festival of monodramas at which the actors from the whole world act on. In Slovakia it is a unique festival of its kind. It is originated in 1995. In its dramaturgy for the long years it tries to find and present different types of one-man theatre, from classical monodramas through dance, motional theatre, pantomime, puppet theatre and alternative theatre up to the one-man show very popular in the present time. Summer months offer the realisation of the open-air theatre performances. The favourite Summer Shakespeare´s festivities offer several stagings of plays of William Shakespeare in unique wing-plats of Bratislava castle yearly. The festival performances are unique also by mutual cooperation of the Czech and Slovak creators. The viewers have a possibility to see the best and most known Czech-Slovakian actors guided by the best directors. Already for more than forty years the Zvolen casttle plays have been carrying out in Zvolen. It is the oldest plein-air festival in Slovakia. It is organized by the Jozef Gregor Tajovský´s theatre in Zvolen which yearly opens the festival by a performance prepared specially for the yard of Zvolen castle. The festival is intended for general public. The performances with popular actors but also the musicals, student´s productions, poetry theatres and contemporary drama are part of the programme. 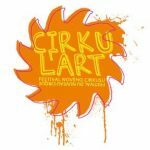 In Bratislava a festival of new circus with a name of Cirkul’art became domesticated in 2011. 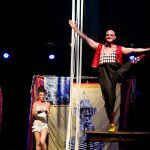 It concerns the international show of creative and artistic productions with varied genre and with focusing to contemporary theatre and modern circus. At first the festival took place in Medical garden, later in various theatres. But a part of the programme plays in the street and it is freely accessible for all spectators, especially for children. The Kremnica gags are a unique festival in Slovakia, the only festival of humour and satire in the Central Europe. It came into being in 1981and it is carried-out regularly at the end of summer in Kremnica. 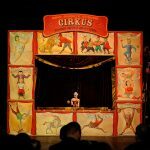 The theatres with comedian titles, cabarets, satirical productions, grotesques but also the new circus and street theatres, particularly from Slovakia and Bohemia, guest at the festival. Also jazz and swing concerts, vernissages and various improvisations are part of the programme. The festival is a national competition and the winner obtains the Golden gander prize from the Humour Academy. In 2004 the Lane of famous noses has been founded within the festival where the nose of a significant Slovak personality will be revealed in the spirit of Hollywood golden stars which left a trace in Slovak humour (besides others, e.g. Július Satinský, Jaro Filip, Katarína Kolníková, František Dibarbora). During the festival also a thought on Museum of kitsch arose that is part of Kemnice with permanent exposition/exhibition with over 1 000 exhibits since then. The Central Europe theatres festival brings the theatres especially from V4 countries and from closer or farer neighbours of Slovakia like Italy, Ukraine or Croatia into Košice at the beginning of September. It has been founded in 2007 and it presents about tens of performances, book presentations and seminars regularly. In addition to theatre spaces the festival performances take place in attractive premises of Košice casern/Culture park or in Tabačka/Kulturfabrik / Culture factory. The festival offers all theatrical genres for broad spectrum of public. The Weekend of attractive theatre took place for the first time in a memory day – on November 17, 1989 – and in the same time it is the first non-state festival in Slovakia. In the present time it is an international festival that orients to alternative theatrical forms and it offers the most interesting from Slovakia and surrounding states. Besides theatre also concerts, exhibitions, discussions, film/cinema, happenings, performance and irregularly also workshops are part of the event. It is a case of almost winter festival, it take place in Zvolen in November. 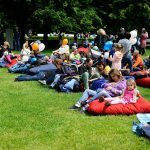 The Kiosk festival is carried-out at Station in Žilina at the end of July and it is defined like a summer festival of an “other” theatre and of brave spectator. The drama, dance also performative productions, which are the theme or form provocatively, create the dramaturgy. The productions are played in premises of Žilina station in Žilina-Záriečie, of reconstructed new synagogue and in various spaces all over the town, the selection of which is part of festival experience. A prize for light design with the POČIN [Feat] title for original work with light is handed-over at the festival. The untraditional programme is completed by workshops, discussions, cinema but also by an exercise and children programme. The festival of the Pro-téza author´s theatre is focused on creators which bring own themes and own texts into the theatre. It concerns an international festival on which there is possible to see the author´s monodramas but also collective appearances. It is organized by the A4, the space of contemporary culture in Bratislava. The Vlnoplocha (Wave area) is one the latest festival in Slovakia that is a Czechoslovakian theatre festival of progressive authorial theatre. The first year of it came true in Banská Štiavnica in 2016. The guest theatres utilize for their productions untraditional premises that the town offers. The aim is to join the Štiavnica genius loci and an inspirational theatre. The Puppeteer´s Bystrica festival exists already since 1977. In 2012 a Double impulse subtitle increased to the festival name according to which the festival is divided into First impulse, for children, and the Second impulse, for adults. In the present time the Puppeteer´s Bystrica is an international biennial event of puppet theatre for children also adults and the 20th festival was carried-out in 2016. The festival is organized by Puppet theatre at the Crossroads in Banská Bystrica. During the First impulse the performances are watched by children jury which will award a prize to chosen staging in conclusion. The workshops, discussions and specialist conferences are part of the programme. The Puppet Žilina is a festival of Professional puppet theatres in Slovakia. It presents the best what was cropped in puppet theatres in the last two seasons. This biennial event came into being in 2008 and it is played in Puppet theatre in Žilina and in diverse premises of the town. The festival presents the puppet theatre in the whole width, before noon there are performances for children, afternoon and in the evening hours appearances for adults are performed. The program is livened-up by concerts, street theatre or street march. The Bratislava puppet theatre´s festival is an international biennial event on which the ensembles from the whole world appear. Every year has its special focusing that interconnects the stagings (the Grimms, Dobšinský) dramaturgically. The Ludus theatre in Bratislava organizes as a biennial event the Adolescent festival which is intended to the teenagers first of all. It concerns an international festival with a focus on to Slovak theatre which dedicates itself to problematical group of the pubescent persons. The intent of festival is to support and inspire the creators to a systematic theatrical artistic also educational work with the young audience. The festival takes place in November. 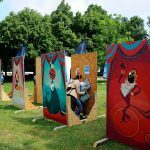 Since 2012 the Košice puppet theatre organizes the VIRVAR (Rumpus) festival: Days of puppet theatre and plays for families. The viewers may see the best from puppet theatres, to visit exhibitions and the children have a possibility to take part in diverse workshops, interactive games and competitions. At the festival the theatres from abroad are also presented. The festival comes true in Košice in June. Stretnutie (Meeting), Setkání, Spotkanie, Találkozás is a name of a show of theatre schools/styles of the V4 countries theatres which is organized by Karol Spišák´s Old theatre in Nitra since 1999. Its goal is a presentation of inspirational performances of professional, alternative and student´s productions of V4 countries, the creation of a space for mutual dialog between the young fledgeling artists and professional creators, of a space for discussion about modern puppet theatre: theatre of sign, subject and theme. The performances, vernissages, readings, film projections, that all is played during four June days in Nitra. The Istropolitana Project international festival of theatrical colleges/universities gives a possibility to the future professional theatre people to confront their forces and artistic seeing. The festival is carried-out with two-year periodicity in Bratislava and it is organized by the College of Performing Arts. It has been founded already in 1977. It is a case of competitive festival, an international specialist jury decides the winner and every performance is accessible to general public. The second college of artistic focusing is the Academy of Arts in Banská Bystrica, it organizes the Artorium festival since 2010 that is dedicated to a presentation of theatre stagings, to film creation of European artistic colleges, visual/plastic arts and musical art and to creative workshops/workrooms. The intent of the Faculty of Dramatic Arts as the main organizer of project is to offer to young people a space for artistic creation, for its presentation and confrontation of creative procedures and results within the creation of the European colleges of arts, and at the same time to encourage the interest in artistic production in region. The Festival of Czech theatre is a traditional part of autumn in L+S theatre in Bratislava. Already from its rise in 1995 its objective is to maintain the continuity and interconnection between the Slovak and Czech theatre after republic division. The Czech performances are regularly completed by a vernissage of exhibition of a chosen Czech artist. From 2005 further Bratislava theatre, the Astorka, organizes the Astorka festival at which it presents the theatre of the whole Europe. Besides the main programme an accompanying program runs that consists of concerts, exhibitions, film projection. 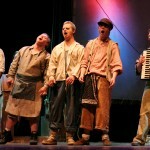 In Slovakia there are several festivals that are oriented to community theatre, respectively to handicapped groups. The Error is an international festival of the homeless theatres. It is a unique festival in Europe focused on theatres in which the people without home and also otherwise socially excluded or handicapped persons play. The Theatre without home is organizer of this event and the festival is carried-out in Bratislava at the end of year. The Arteterapia (Art therapy) festival was held in Banská Bystrica since 2002 and it was shifted into Bratislava in 2014. It gives space to engaged community art which reflects social and political goings-on. The theatres working with handicapped people tend to guest in these theatres as a rule. The DRAMA QUEER theatre festival brings the stagings with the LGBTI problems. The aim is to make visible the group of lesbians, gays, of bisexual, transgender, intersexual and queer people, to speak about their problems and feelings especially by a form of author´s theatre. The festival arose in 2013 and it is set in Bratislava. It is organized by NOMANTINELS association. During the summer in regions there are carried-out many minor festivals, which are determined particularly for the general public, possibly for tourists. In addition to major cities the theatrical festivals are for example also in Tatranská Lomnica or on yards of castles and manor houses. Their goal is to variegate the summer season in which the professional theatres are on holiday. These festivals are characteristic by that thing that the programme consists of professional also amateur theatres without distinction.